In our previous article about money in videogames, we wrote a section about a playthrough of The Elder Scrolls IV: Oblivion in which we went through the game without ever buying or selling anything. The quick version of the story is that it is perfectly possible to play Oblivion with this added limitation - in fact, it makes for a somewhat liberating experience. In any case, after spending a while on this playthrough, we decided to try the complete opposite playstyle for contrast: that of a charismatic merchant, whose objective in life is to make as much money as possible. Our experiment has led to some interesting things that add to what we were saying in the previous article, but our write-up about it got so long that we thought it would be easier to just make a new article. So, here we are. This is the story of Sereth, the money hoarder. 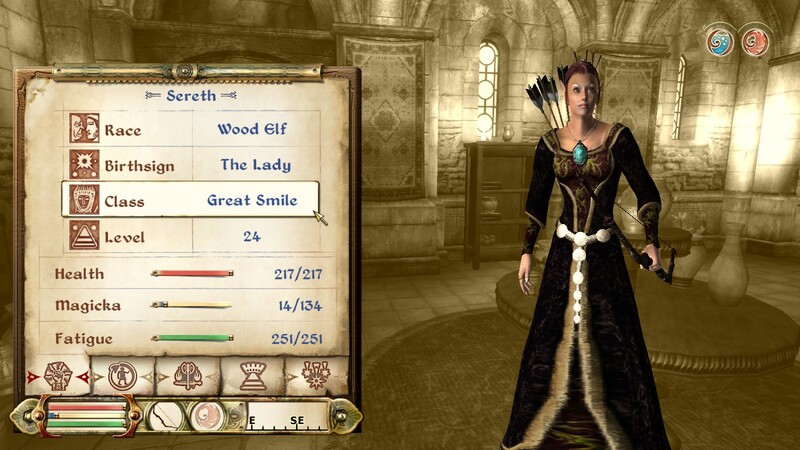 Sereth is a wood elf with a custom class we called the Great Smile. We did it this way so to give her a boost in the Personality stat and let her have a unique combination of skills - including Speechcraft to sweet-talk people into better deals, Alchemy to allow her to make potions that then she can sell for an eye and a liver, and, of course, Mercantile, which we went out of our way to level up as much as possible. Since you gain experience in Mercantile based on how many selling transactions you perform, regardless of the value of the items or how many of them you are trying to sell, it goes that the best way to level up Mercantile is to sell many cheap items, one at a time. Yes, I have 300 more of these. Yes, I would like an individual receipt for each and every one of them. What? Why are you crying? So, Sereth would come to town with a quiver full of hundreds of arrows, which she would then insist to sell to the shop one by one. We imagine that, after a few afternoons spent selling arrows like this, all the shopkeepers would keep watch for each other in case they see Sereth in town, in which case they'd all lock their doors and hide under their beds, hopefully away from Sereth's Mercantile-farming plans. Another thing we did to level up Mercantile was to use every opportunity to train. Oblivion features a system of training which lets you have up to five bonus skill increases per level - for a price proportional to how high is the skill you want to train; the higher the skill, the more money required to purchase training. So, Sereth found the merchants that would teach her their trade secrets, and would not sleep to level up unless she had been taught everything she could learn for her level. In the beginning of our game, this meant that almost all of our money went into funding Sereth's education - so, strangely enough, playing as a merchant meant that we spent a longer portion of the early game being "poor" - only because we spent all the money we made, of course, but this also had the side effect that Sereth had no money to afford anything else. So, while she was training to become a merchant, she lived in the haunted house in Anvil, since it came cheap - we weren't strong enough to break the curse yet, so we had to just deal with the ghosts. We figured that her natural charisma might make even the vengeful spirits of necromantic abuse into agreeable neighbors. Yeah, and the sky is blue. In the meanwhile, we started to have a problem - the problem that we'd guessed this playstyle would bring: being constantly over-encumbered. Since Sereth had no boosts in Strength and we didn't use many skills that could level it up, she couldn't carry a lot of weight. We would need to rely on Feather potions, and later on Feather spells as soon as our Alteration skill would be high enough to let us do so. However, at the beginning of the game when your Alchemy skill isn't very developed, the ingredients that could be used for a Feather potion are scarce, and so we simply couldn't make enough of these potions. We had to time our adventures based on how many Feather potions we had available; once we'd be out, we'd need to turn around, escape from whichever ruin we were exploring, and run to town at full speed, before our Feather would run out. 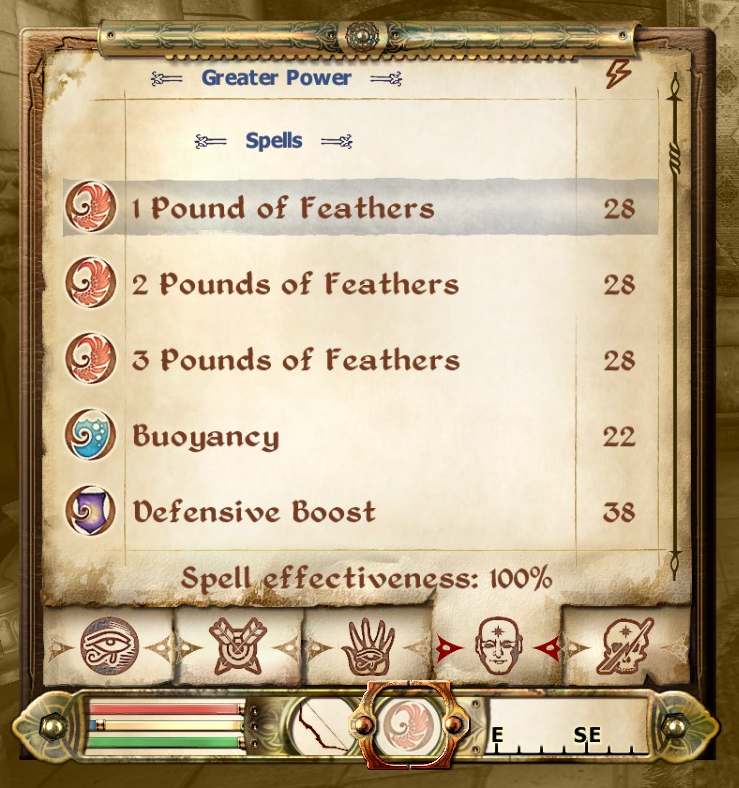 Note the three custom-made Feather spells. Each one provides 100 points of Feather, and, even in combination with the standard spells, sometimes we still end up over-encumbered. Things gradually improved as our Alchemy proficiency progressed and as we gained access to the Feather spells, but the final result is that, to carry all the loot that Sereth would want to sell, she must be constantly high on Feather. That's no way to live. 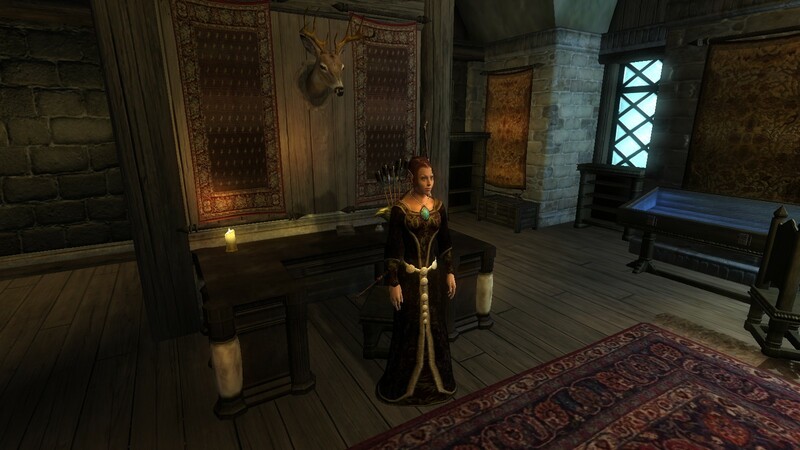 Anyway, as we went on, Sereth became a better and better merchant, until she was proclaimed an Expert of Mercantile. At this point, a particular perk is unlocked for this skill: you are now able to invest in shops. We thought this mechanic would open a whole new part of the game - after all, there is a counter for how many shops you've invested in in your character's stat page, together with such counters as Horses Owned and Diseases Contracted. Although Rosy has sank thousands of hours into Oblivion with dozens of different characters, she'd never had a character whose Mercantile was high enough for this. 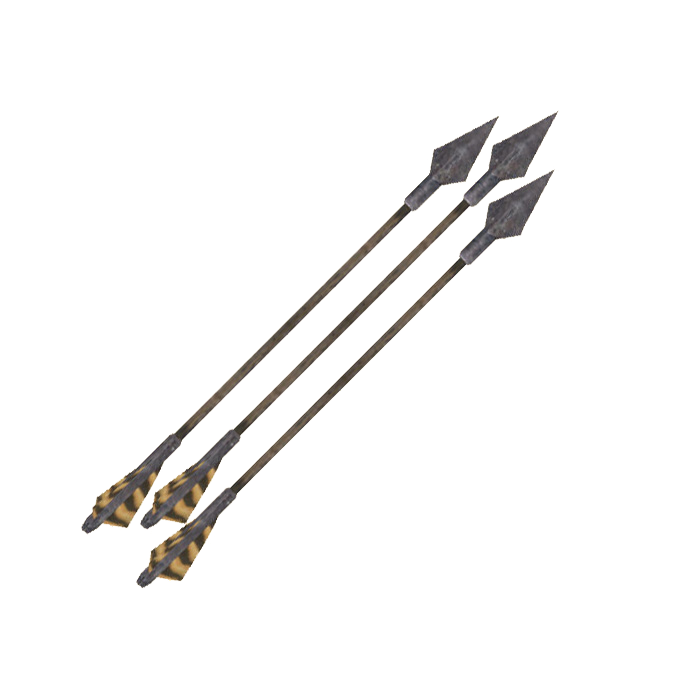 We have some arrows for you! Since we'd mostly relied on selling things through Thoronir in the Imperial City and helped him out with his business before, we decided that his shop would be the first we'd invest in. He took 500 gold from us, and had a little dialogue in which he sounded happy to let us become an investor, and that the extra money would let him have better inventory. Except... that turned out to be all flavor text. His inventory wasn't any different. All that changed is that now the amount of money he has available to barter has been permanently raised. That's underwhelming. We were expecting to access a part of the game in which we would have to do some managing of our investments, with interest and so on. 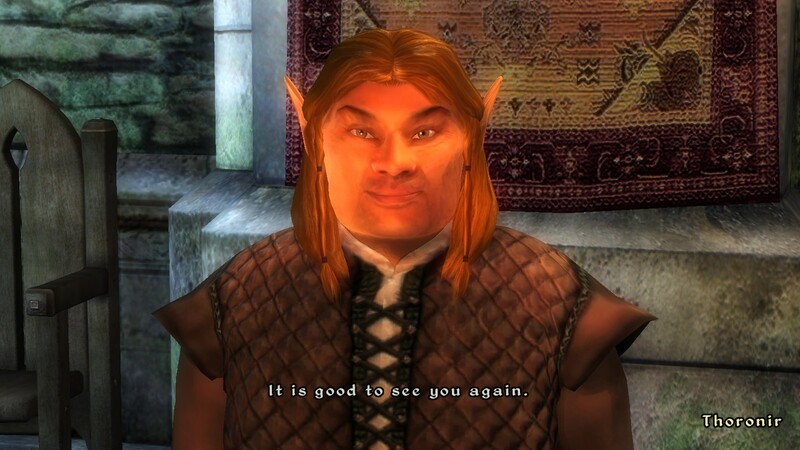 It's not even like we were expecting too much - Oblivion is known for having entire complex mechanics that you might never get to see unless you choose so, like vampirism and enchanting. We'd thought the ability to invest in shops would be one of them, but instead it's just a one-time payment to... what exactly? Let us make more money? But at this point, we're already so rich. We're past the bump. We're around level 12 and the loot available in the world has gotten good enough that we're making money, even with the expensive tutoring. What is even the point of letting us make even more money? We then invested in Borba's shop in Cheydinhal, since we'd probably made her cry the one time we went there and sold 164 arrows one by one. She had the same exact dialogue that Thoronir had. They didn't even bother making more than one line of dialogue for this. Boo. Eventually, Sereth became a Master Merchant. As the best Merchant ever, everyone she shops with has more money to haggle with her. Once again, it just leads to more money, which at this point has become useless - we're so rich, we were able to buy the most expensive house of the game with all the furnishings in one fell swoop, as if it was candy. But, somehow, Sereth is still compelled to hoard as many riches as possible. Frankly, this playstyle seems deranged. Maybe she should learn a thing or two from Shun.